I was going to be so impressed with your lovely organized pantry. But yes, I we stockpile when it's on sale, too. My kids don't understand why I won't just buy them whatever cereal at the moment they decide they want it. It's NOT on sale, I say, and I'm not paying $3.69 for a box of cereal. I go through seasons where I stock pile. I've been trying to rev myself up for that again. Back to school always throws me off my game. I ALWAYS stock up for before school starts because I know how exhausted I am. Usually that subsides after about a month. We're on week 10 and I'm still struggling this year! Partly because I've been sick so much. SO, thanks for the post. I'm going to get my self together and start stock piling! P.S. That's quite possibly the longest blog comment I've ever left! Can you tell I'm on modified voice rest?!? When you said you never pay more than 2.00 for a box of brand name cereal ... ? You just re-classified yourself as one of the "Great and powerful Gods" IMO. (movie line: El Dorado) WHOA. I just never buy name brand cereal because I never find it as cheap as you do. wow! And I do some stock piling. 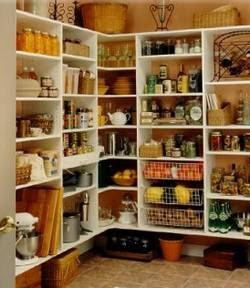 And wouldn't it be NICE to have a pantry like that? Moment of reverence. Sigh. Still feeling the awe over here.